The Aptitude Test for RRB ALP Stage 3, scheduled for 16-Apr-2019 has been postponed. A fresh date for this Aptitude Test will be announced shortly. The Railway Recruitment Board (RRB) has released the answer key for ALP Stage 2. The exam was conducted from 21st to 23rd Jan 2019 with a re-exam on 8th February 2019. Click on the link below to check your answer key. Those candidates who could not appear the RRB Exam against CEN No. 01/2018 on 1 st shift of 21.01.2019 at the centre iON Digital Zone iDZ 1, Anthem Global Technology Services, N/24-27, New IT Zone, Near New OTV Office, Chandaka Industrial Estate, Patia, Bhubaneswar, Odisha – 751024 (Centre Code – 7908) will be allowed to appear on 22.01.2019 or 23.01.2019. The candidates will receive email/SMS from RRB by an evening of 21.01.2019. The Railway Recruitment Board (RRB) will release the admit card for the second stage computer-based test (CBT) of Group C ALP, Technician posts on Thursday, January 17. The candidates can download the admit card through all the region based official websites. The Group C recruitment examination will be conducted on January 21, 22 and 23. All India Online Open Test provides you Full Syllabus balanced Question Paper as per the Difficulty level of actual exam; it is based on exact pattern to evaluate your preparation towards ALP CBT 2 Exam 2018 and provides tentative All India Rank to refine your preparation. OnlineTyari will be conducting ALP CBT 2 Exam 2018 All India Test (AIT) from 11-14 January 2019. फ्री ALP CBT 2 परीक्षा ऑल इंडिया टेस्ट (AIT) 2018 : सम्मिलित होने के लिए यहाँ क्लिक करें ! Yesterday, Railway Recruitment Board has released a notice for the Admit Card for ALP stage-II Exam. As of now, RRB has activated the link to know the exam date and city. click on the below link to know the exam date and city. 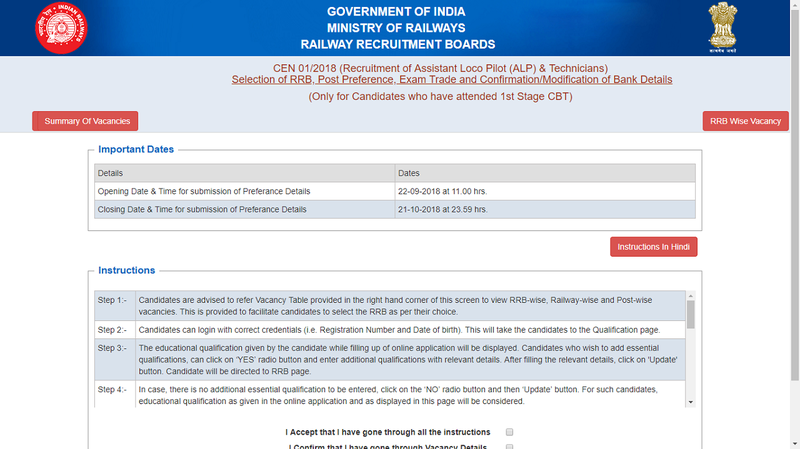 Railway Recruitment Board has released a notice for the Admit Card for ALP stage-II Exam. The Admit Card for Stage 2 will be released on 17th Jan 2018. Initially, the last date for correction of Bank account was given as 25-12-18. However to facilitate the candidates to complete the bank account correction, the last date for bank account correction has been extended to 31-12-18 and accordingly the Bank account correction link shall be live till 31-12-18. Railway Recruitment Board has declared the revised result of the first stage examination held in the month of August/September. The result was declared on 2nd November 2018. As of now, RRB has declared the revised result after reviewing the errors in the question paper. Click on the below-given link to view the revised result. The Roll Numbers of the provisionally qualified candidates for 2nd stage CBT are arranged horizontally in ascending order and not in order of merit. Railway Recruitment Board released a notice regarding correction of bank account details. Candidates whos transaction has failed due to some reasons have the chance to make the correction. RRB will activate the link the link from 21st December 2018. Railway Recruitment Boards have initiated Refund of Examination Fee to the candidates who had attended the First Stage Computer Based Test (CBT) for ALP/Technicians against CEN 01/2018. During the refund process, it is noticed that for some of the candidates the refund has failed due to incorrect Bank details furnished by them such as wrong account number, wrong IFSC Code of the Bank Branch, filling up customer ID in place of account number etc. NOTE: Link will be provided on the official websites of RRBs which will be live from 18/12/2018 to 25/12/2018. Results of First Stage Computer Based Test (CBT) examination were published on the official websites of all RRBs on 02-11-2018. Few candidates have represented that there are errors in question/translation. In the wake of these representation, all language translation of all the question papers is being reviewed. It is expected that after this review fresh result of 1st Stage CBT along with the revised list of candidates shortlisted for 2nd stage CBT is likely to be published by 20.12.2018. Accordingly, the Exam date for 2 and Stage CBT has been rescheduled on 21st, 22nd and 23rd January 2019. 1 Mathematics 25 25 90 Minutes (120 minutes for eligible PWD candidates accompanied with scribe). Negative Marks: There will be negative marking for wrong answers. For every wrong answer,1/3rd mark will be deducted. Railway Recruitment Board released an important notice regarding the exam result of the first stage. According to the official notification, the candidates have made representations about the discrepancies in the answers of certain questions. there were some errors in the answer key and for that RRBs have decided to review the answers of all the questions. The revised answer key will be made to all the candidates soon along with their revised score on their candidate login. Accordingly, the revised list of the shortlisted candidates will be prepared which will take sometime causing the delay in the CBT ALP Stage II exam. The Second Stage CBT will now begin from 24th December 2018. Railway Recruitment Board has finally declared the result of the first computer-based test held in the month of August. Based on the performance in the 1st Stage Computer Based Test (CBT) conducted during the period from 09.08.2018 to 04.09.2018 by Railway Recruitment Boards for the posts of Assistant Loco Pilot and Technicians against CEN 01/2018, candidates bearing the following Roll Numbers have been provisionally shortlisted to appear in the 2nd Stage Computer Based Test (CBT) as per their merit and post preferences. Candidates can view their individual scores by logging in official websites of RRBs by entering their Registration Number and Date of Birth. यहाँ क्लिक कर समस्त सूचना हिंदी में पढ़ें और अपना रिजल्ट देखें ! The result processing of First Stage CBT is now in its final stage. 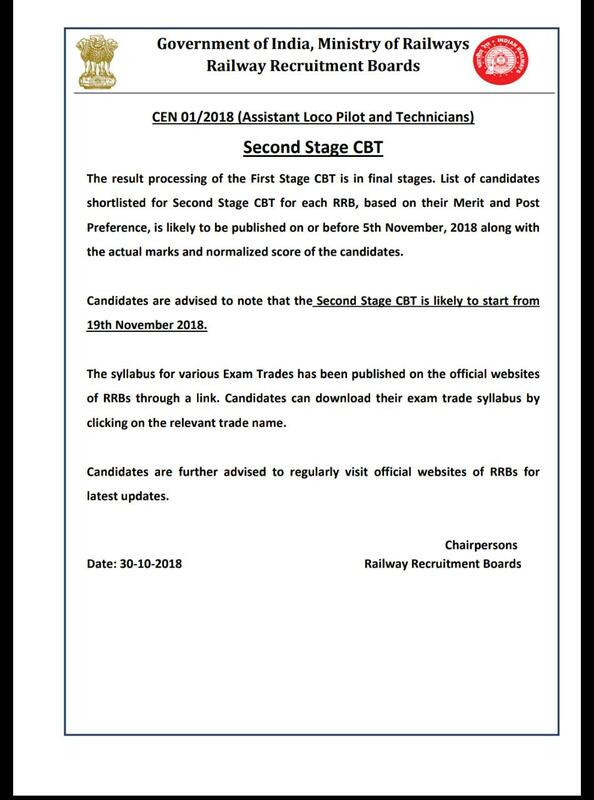 Shortlisted candidates for RRB ALP CBT 2 based on their merit list as well as their post preferences is likely to be announced on 5th November 2018. At the same time, the actual scores and the normalised marks will also be given out to candidates. Click here to read official notification. RRB ALP ONE TIME ADDITIONAL OPPORTUNITY: Submission of Additional Educational Qualifications and modification of selected RRB, Post preferences and Exam trade. Good news to all ALP Aspirants!! RRBs have examined these representations and have decided to give an opportunity to all such candidates for adding their additional eligible qualifications viz, HSC (10+2) in Physics and Maths, Diploma/Degree, more than one ITI trade, provided they had acquired these qualifications on or before 31-03-2018, the closing date of CEN 01/2018. Similarly, many candidates have requested an opportunity to modify their selected RRB, post preferences and the exam trade. RRBs have decided to provide a one time opportunity to candidates for such modifications also. The link, with above changes, will be live again from 11:00 hrs of 01-10-2018. The last date of submission stands extended up to 23:59 hrs of 06-10-18. NOTE: The candidates, who have already completed the RRB selection, post preferences, exam trade, and bank account details and do not wish to furnish any additional qualifications or modify, need not do anything and their submitted details shall remain valid. All India Online Open Test provides you Full Syllabus balanced Question Paper as per the Difficulty level of actual exam; it is based on exact pattern to evaluate your preparation towards Railway ALP CBT 2 Exam 2018 and provides tentative All India Rank to refine your preparation. OnlineTyari will be conducting Railway ALP CBT 2 Exam 2018 All India Test (AIT) from 19-22 October 2018. फ्री रेलवे सहायक लोको पायलट (ALP) 2 ऑल इंडिया टेस्ट (AIT) 2018 : सम्मिलित होने के लिए यहाँ क्लिक करें ! The link will be active from 22nd September 2018, time 11:00 hrs to 1st October 2018, time 23:55 hrs. RRB ALP रिक्तियां हुई 64371 हजार: अभी जानें ! RRB ALP रिक्तयों में हुई वृद्धि: यहाँ क्लिक कर अभी जानें ! Note: Answers are based on Provisional Answer Keys. The answer may change in the Answer Keys Finalized after Objection Management. Evaluation will be done on Final Answer Key. The 1st Stage CBT of those (i) candidates whose examination had been canceled on 9th August 2018, (ii) Candidates of Kerala whose examination on 17th, 20th & 21st August 2018 had been postponed and (iii) eligible candidates whose scheduling has not yet been released is now fixed on 4th September 2018. E call letter shall be available for download from 31st August 2018. To improve your chances of cracking RPF Constable, OnlineTyari will be testing the potential of aspirants through RPF Constable All India Test. Thinking of how to stay ahead of others? It is time to put your skills to the ultimate test – RPF Constable (AIT). Sectional: Tests based on sections like Reasoning, Quantitative Aptitude, General Awareness, General Science, etc. Railways Group C recruitment for Assistant Loco Pilot and Technician Grade III (ALP) is done by Railway Recruitment Board (RRB) at the divisional level. Some of the posts in this group are the Assistant Loco Pilot, Driver, Technician and others. It may be noted that candidates can choose only one RRB and indicate their preference of Railway Units and posts against vacancies notified for the chosen RRB only. For detailed information on RRB ALP 2018, download our PDF. Click here. RRB ALP अंतिम क्षण की तैयारी रणनीति: परीक्षा में बैठने से पहले जरुर देखें ! रेलवे ALP का मॉक टेस्ट्स सीरिज OnlineTyari पर कैसे लें ! रेलवे ALP और तकनीशियन परीक्षा 2018: 20 दिवसीय स्टडी प्लान ! रेलवे भर्ती परीक्षा 2018 : रीजनिंग/जनरल इंटेलीजेंस की तैयारी कैसे करें ? रेलवे परीक्षा सामान्य विज्ञान की तैयारी : कैसे करें ? रेलवे परीक्षा सामान्य ज्ञान और समसामयिकी (GK) की तैयारी : कैसे करें ? Only single online application (common to all the notified posts- ALP & Technicians) has to be submitted by the candidate to RRBs. Minimum percentage of marks for eligibility in various categories : UR -40%, OBC-30%, SC-30%, ST -25%. These percentage of marks for eligibility may be relaxed by 2% for PWD candidates in case of shortage of PWD candidates against vacancies reserved for them. The Second Stage CBT shall have two parts viz Part Aand Part B as detailed below. This part is qualifying in nature and shall have questions from the trade syllabus prescribed by Director General of Employment & Training (DGET). Candidates with ITI/Trade Apprenticeship qualification will be required to appear in the section having questions from the relevant trade. Candidates holding Degree, Diploma and HSC (10+2) having eligibility for the posts of ALP have to select relevant trade from the list of trades listed against their engineering discipline/HSC (10+2). Candidates equal to 8 times number of ALP vacancies for each of the communities i.e. UR, OBC-NCL, SC and ST (including ExSM) shall be short listed for Computer Based AT (based on their performance in Part A of the Second Stage CBT subject to their qualifying the Part B of Second Stage CBT) from among the candidates who have opted for the post of ALP. Such shortlisted candidates should produce the Vision Certificate in the prescribed format in original during Computer Based AT, failing which they will not be permitted to appear in the Computer Based AT. candidates equal to the number of vacancies will be called for Document Verification. In addition, candidates equal to 50% (may increase or decrease at the discretion of Railways) of the number of vacancy for various posts will also be called for DV. These additional candidates will, however, be considered for empanelment only if there is a shortfall in empanelment from the merit list or/and as replacement against the shortfall on account of non-joining of recommended candidates in the working post or/and any other special requirements. In case of two or more candidates securing same marks, their merit position shall be determined by age criteria i.e., older person shall be given higher seniority. Appointment of selected candidates is subject to their passing requisite Medical Fitness Test to be conducted by the Railway Administration, final verification of educational and community certificates and verification of antecedents/character of the candidates. Candidates may please note that RRBs only recommend names of the empaneled candidates and appointment is offered ONLY by the respective Railway Administrations. It has now been decided that Candidates who have paid Rs 250 will be refunded the entire amount and those who have paid Rs 500 will be refunded Rs 400. Candidates should possess Matriculation/ SSLC plus ITI from recognized institutions of NCVT/ SCVT in any trade. A. Mathematics - Number system, BODMAS, Decimals, Fractions, LCM, HCF, Ratio and Proportion, Percentages, Mensuration, Time and Work; Time and Distance, Simple and Compound Interest, Profit and Loss, Algebra, Geometry and Trigonometry, Elementary Statistics, Square Root, Age Calculations, Calendar & Clock, Pipes & Cistern etc. B .General Intelligence and Reasoning - Analogies, Alphabetical and Number Series, Coding and Decoding, Mathematical operations, Relationships, Syllogism, Jumbling, Venn Diagram, Data Interpretation and Sufficiency, Conclusions and Decision Making, Similarities and Differences, Analytical reasoning, Classification, Directions, Statement – Arguments and Assumptions etc. C. General Science - The syllabus under this shall cover Physics, Chemistry and Life Sciences of 10th standard level. A. Mathematics- Number system, BODMAS, Decimals, Fractions, LCM, HCF, Ratio and Proportion, Percentages, Mensuration, Time and Work; Time and Distance, Simple and Compound Interest, Profit and Loss, Algebra, Geometry and Trigonometry, Elementary Statistics, Square Root, Age Calculations, Calendar & Clock, Pipes & Cistern etc. B. General Intelligence and Reasoning- Analogies, Alphabetical and Number Series, Coding and Decoding, Mathematical operations, Relationships, Syllogism, Jumbling, Venn Diagram, Data Interpretation and Sufficiency, Conclusions and decision making, Similarities and differences, Analytical reasoning, Classification, Directions, Statement – Arguments and Assumptions etc. C. Basic Science and Engineering- The broad topics that are covered under this shall be Engineering Drawing (Projections, Views, Drawing Instruments, Lines, Geometric figures, Symbolic Representation), Units, Measurements, Mass Weight and Density, Work Power and Energy, Speed and Velocity, Heat and Temperature, Basic Electricity, Levers and Simple Machines, Occupational Safety and Health, Environment Education, IT Literacy etc. Questions will be trade based and the syllabus will cover as per the ITI syllabus metioned for that particular trade. 1 Mathematics (गणित) 25 25 90 Minutes (120 minutes for eligible PWD candidates accompanied with scribe). • Negative Marks: There will be negative marking for wrong answers. For every wrong answer, 1/3rd mark will be deducted. The major challenge posed by this job profile is the constant travelling. But, an RRB ALP is well compensated in the form of Running Allowance based on the monthly kilometres you travel in the locomotive. Technicians are skilled workers that work with complex systems or perform highly technical mechanical or diagnostic tests. Depending on the field, technicians may work supervision of a Senior Section Engineer (SSE) or a Junior Engineer (JE). Technicians can work indoors or might spend most of their time outside. Expected safest score for Loco Pilot and Technician will be 65+ marks. Aspirant should target 60+ question with 90% accuracy in order to qualify first CBT. How to prepare reasoning to get maximum score in RRB Group Examination? How to prepare Math to get maximum score in RRB Group Examination? How to prepare General Awareness to get maximum score in RRB Group Examination? How to prepare General Science get maximum score in RRB Group Examination? I am appearing ALP and Technician Examination first time how can I start preparation? How can I apply for ALP and Technician Recruitment 2018? What is the basic eligibility criteria for ALP and Technician Recruitment 2018? Please share the dates for RRB ALP and Technician Recruitment 2018- All India Test? Please provide Test Packages for RRB ALP and Technician Recruitment 2018? 1. Mini Pack : click Here ! 2. Regular Pack : click here ! 3. Ultimate Pack : Click Here ! Is there any free test for RRB ALP and Technician Recruitment 2018? What will be safest score for RRB ALP and Technician Recruitment 2018? A. Expected safest score for Loco Pilot and Technician will be 65+ marks. Aspirant should target 60+ question with 90% accuracy in order to qualify first CBT. What is the exam date for RRB ALP and Technician Recruitment 2018? A. Candidates should have their own mobile number and valid & active personal email id and keep them active for the entire duration of recruitment. The email id should be unique. Query about Forget Register id / register id is deleted? A. Please click on "Forgot Registered Id" option given in the Already Registered page to get your Register id. What is the procedure to login? A. Use Registration ID and password which was displayed after registration and sent to your registered email id & mobile number for logging in. How do I know that my application is submitted? I have not received email/sms during registration procedure? Why? A. Check the correctness of mobile number and email id entered by you. Check your spam mails. You may also refresh and check your email after intervals. If it is noticed that the email id / mobile number has been wrongly entered inadvertently, click on change email id/mobile number option. What should I do if I forget password? A. Your password is your registered date of birth in the format DDMMYYYY. What all documents should I upload at the time of application? When I try to upload the Photo/SC /ST certificate, it doesn't accept Why? A. The documents should be in JPG/JPEG format for successful uploading and the size should be: a. Passport size photos - 15 to 40 kb b. SC/ST certificate - 50kb to 100 kb. How do I know that I belong to OBC creamy layer or Non-creamy layer? A. The family income of the OBC-Non Creamy Layer candidate should not be more than 8 Lakhs. The OBC certificate should be in the format prescribed as at Notification Annexure-II wherein clear mention is made regarding the candidate not belonging to persons/sections of creamy layer. These are considered to be Non-Creamy Layer candidates. A. For candidates belonging to SC / ST / Ex- Servicemen / PWDs / Female / Transgender / Minorities / Economically backward class: Rs 250/-. This amount duly deducting bank charges shall be refunded to those who appear in first stage CBT All other candidates: Rs 500/- Out of this Rs 400/- duly deducting bank charges shall be refunded to those who appear in first stage CBT. Whether examination fee is re-fundable? A. The fee of Rs 250/- is refundable duly deducting bank charges to SC / ST / Ex- Servicemen / PWDs / Female / Transgender / Minorities / Economically backward class candidates on attending First Stage Computer Based Test. For others who have paid Rs 500/-, Rs 400/- shall be refunded duly deducting bank charges to those who appear in first stage CBT. Can I take the print out of the application any time? What should I do if I have lost my SSLC/SSC/Matriculation Certificate? A. You cannot register without furnishing SSLC/Matric roll number and year Of passing as available in the certificate. If these details are furnished based on the copy of the certificate and in case the candidate is called for DV, the original/Duplicate SSLC/SSC/Matriculation certificate has to be submitted. Can I edit the details in the application? A. The details in the application (except mobile number, email id and State) can be edited with the modification option by paying modification fee of Rs.100/- each time which is non-refundable. The Modification can be done only twice. Pay the modification fees and modify your Application / Photo, The modification can be done only twice. How will I come to know whether my application is accepted / rejected? Query about Exam trade selection? A. Select any one Exam trade from the given drop down box. Query about Selecting RRB Zone / Division / Unit? A. The application is common for all the RRBs. The option of RRB and the preference for posts within the opted RRB shall be taken after first stage CBT. Query about Selecting Post / Preference of Post? Query about Additional details till not activated after the payment? A. Click on the "Check Payment Status" option provided in home page. To check your payment status. If payment is successful you can fill Additional Details. If failed / pending contact Your Bank. Query about Payment made through Post office? A. If paid through Post Office please wait 48 hrs. Please check your payment status in the post office website mentioned in the challan. A. After selecting EBC option you have to select Yes for "fee concession and refund facility" then only your payment will be considered as 250/-. Query about were to pay the exam fee? A. a. ONLINE fee payment through internet banking or debit/credit cards upto 30.03.2018 till 23.59 Hrs. b. OFFLINE fee payment through i. SBI Bank Branch for Challan Payment mode closes on 28.03.2018 at 15.00 Hrs in any branch of SBI. ii. Post Office Challan Payment mode closes on 27.03.2018 at 15.00 Hrs in any branch of computerized Post Office. Query about Ex-Servicemen employees Attestation Date? A. The date which is mentioned in the attestation certificate or ask the authorized person in your department to issue that date. Query about After Modification the candidate is being asked to pay exam fees of Rs 500/-? A. You have changed your category from Fee exempted refundable category of Rs 250/- and hence you have to pay examination fee of Rs 500 again. However on appearing in 1st stage CBT, Rs 400 shall be refunded. Query about In case the exam trades selected for various Qualifications viz 10+2, ITI, Diploma , Degree are different, what will be my Exam Trade for second stage CBT ? A. Suitable instructions will be issued regarding Exam trade for second stage CBT to the candidates who qualify in First stage CBT. What to select in option of SSLC/SSC/Matriculation? Please refer your 10th certificate and select any one of the option. Query About modification fees from Rs. 250 to Rs.100? A. All those who have made modifications to the application earlier with the payment of Rs 250 shall get the refund of the excess amount of Rs 150 to the beneficiary account furnished in the application. Query About Refund details for Rs 500 candidates? A. Photo taken date and Name should be mentioned in the photo. Query About Forgot registration Id shows you have entered wrong details ? A. Enter the correct details what you have given at the time of Registration. Query About Address is not accepting? A. Address should not contain any special characters so please enter address without any special characters. Query About Which Address should i mention in the application? A. Furnish the address to which the Communication should be made.